About Ukraine, like many other countries in the region and around the globe today, continues to face exceptional economic challenges. So far the country has weathered the storm better than many commentators had expected. Clearly, its geographic position and natural resources, as well as the ‘human factor’, have all played important roles in this achievement. Ukraine’s proximity to both the European Union and Russia, the sheer quantity of its consumers (nearly 46 million) and the physical size of the country make it an excellent location for businesses to expand both locally and regionally. The 2012 UEFA European Football Championship was a success, and investment for that event has significantly improved infrastructure (roads, railway, and airports). 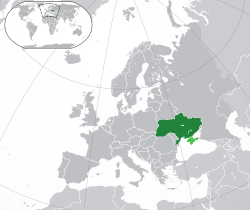 Ukraine is the second largest country in Eastern Europe and is bordered by Russia to the east; Belarus to the north; Poland and Slovakia and Hungary to the west; Romania and Moldova to the southeast; and the Black Sea and Sea of Azov to the south. It is a member of the CIS. Ukraine is a unitary state composed of 24 oblasts (provinces), one autonomous republic (Crimea), and two cities with special status Kiev, its capital and Sevastopol, home to the Russian Black Sea Fleet under a leasing agreement. It is a republic under parliamentary and presidential system with separate legislative, executive, and judicial branches. The domain religion in the country is Eastern Orthodox Christianity, which has also heavily influenced Ukrainian architecture, literature and music. Ukraine gained independence after the dissolution of the Soviet Union in 1991. The Ukrainian economy grew at an annual rate of over 7% from 2000 to 2008, and nominal GDP reached UAH 950 billion (USD 180 billion). However, in the fall of 2008, the global economic crisis resulted in a contraction of Ukrainian industrial production, a devaluation of the national currency, and a severe credit crunch. GDP contracted by approximately 15% in 2009 but then grew at an average of 5% p.a. in 2010 and 2011 before a further recession in the second half of 2012. Ukraine’s main export products are metals and agriculture products (together accounting for 40% of exports). The main items imported are mineral fuel, petroleum and petroleum distillation products, machines and equipment, and chemicals. CIS and European countries account for more than 70% of Ukraine’s foreign trade.